In what could be seen as a retaliation to the killing of Maoist cadre in the recent times by the security forces, Maoists torched a bus carrying about 26 passengers to Bijapur in Chhattishgarh. 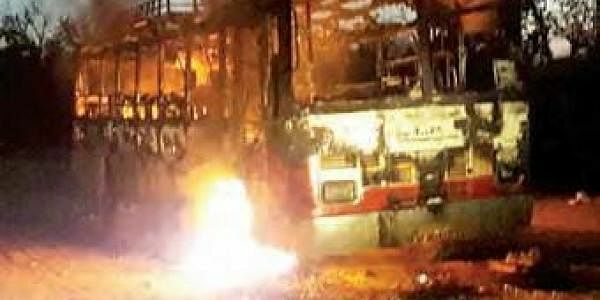 BHADRACHALAM: In what could be seen as a retaliation to the killing of Maoist cadre in the recent times by the security forces, Maoists torched a private bus carrying about 26 passengers to Bijapur in Chhattisgarh from Venkatapuram of Jayasankar Bhupalapalli district, at Metlacheruvu village on Saturday evening. Metlacheruvu, falling under Bhadrakali police limits, is 50 km away from Telangana state border. According to information reaching here, the bus belonging to Bijapur-based Gupta Private Travels ply between Bijapur and Venkatapuram on a daily basis. The bus starts from Bijapur in the morning and reaches Venkatapuram by afternoon. The bus with 26 passengers on board started at Venkatapuram on Saturday morning and as it reached Metlacheruvu village in Bijapur district around 4 pm, a group of armed Maoists waylaid the bus and asked all the passengers to get down. Later, they poured petrol and torched the bus. Passengers had to face lot of problems in reaching their destinations as very few jeeps and private vehicles travel on this route. Police did not reach the place, which is a heavily Maoist-infested area, till last reports came in. Gupta travels started operating the services only a month ago, sources said.